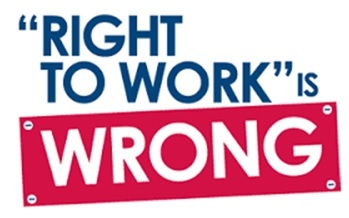 Senate Bill 1, The KY Right-To Work Act passed the KY State Senate in January by a vote of 24-12. It was heard in the House Labor and Industry Committee Meeting on February 13th, 2015. Testimony by KY AFL-CIO President Bill Londrigan and UFCW Local 227 Representative Caitlin Lally drove home the point that a Right-To-Work Law is bad for Kentucky and be would devastating to Organized Labor and all Kentucky’s workers. Senate Bill 9, which excluded Prevailing Wage from all educational facilities, passed the State Senate by a vote of 24-12. It was also heard in the same L & I Committee on February 13th, 2015. Dr. Peter Philips and I gave testimony that no savings will occur for tax payers and would only drive down the wages and benefits of all construction workers in Kentucky. SB-1 and SB-9 were both defeated in Committee on February 13th with all Democrats voting NO along with Labor endorsed Republican Jimmy Stewart. The reality is that these two Bills were defeated on November 4, 2014. Your hard work and the dedication of our members to elect a Democrat majority in the KY House made this possible today. Approximately 600 union members filled the halls in Frankfort to support Organized Labor in the defeat of these anti-union Bills. The KET video of testimony on Senate Bill -1, the KY Right-To-Work Act is at the beginning of the video. The Prevailing Wage testimony on Senate Bill – 9, starts at 1:29 of the recording. Please take the time to send an e-mail to the State Representatives listed below to thank them in their support of the Union members and their families in Kentucky. Every Democrat on the House Labor & Industry Committee supported us along with Republican Representative Jim Stewart. Also, please send a thank you to Rep. Larry Clark for his continued support and comments at the meeting.